A special thank you to Armstrong Flooring for sponsoring this post. 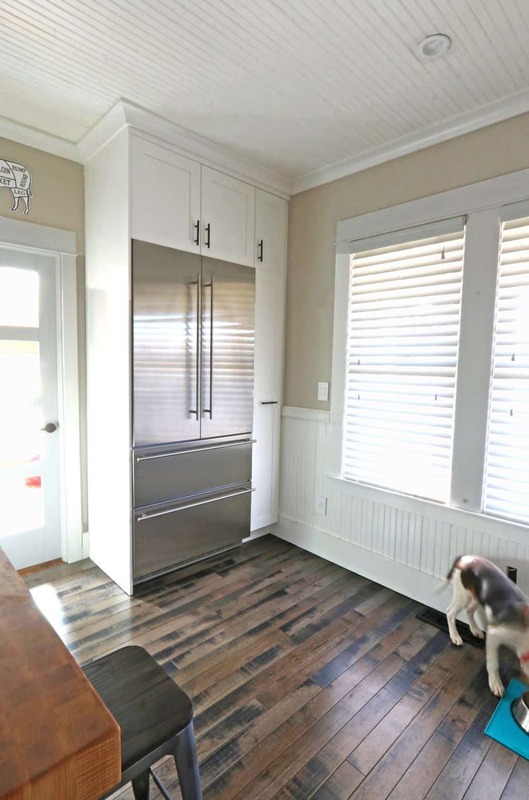 Welcome to Part 3 of our 1912 Modern Farmhouse Kitchen Remodel! We went with traditional-style cabinets with a contemporary flair. 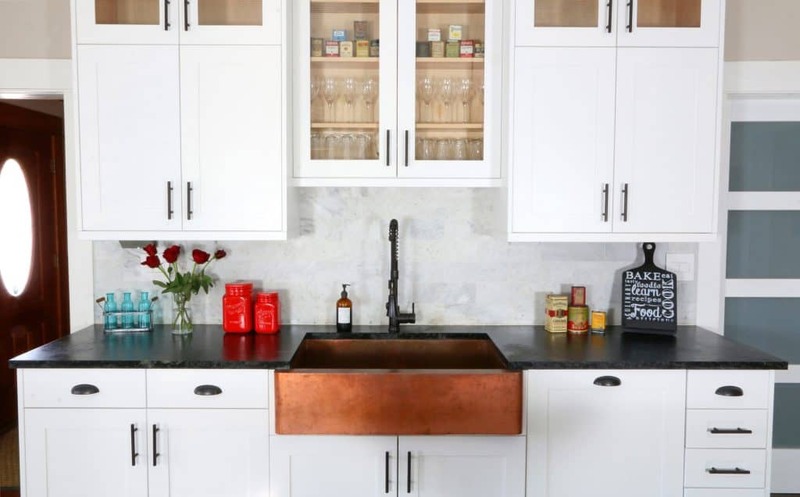 And we used traditional materials that would have been correct for the time period of the home, such as soapstone, copper, brick, marble, hardwood and butcher block. 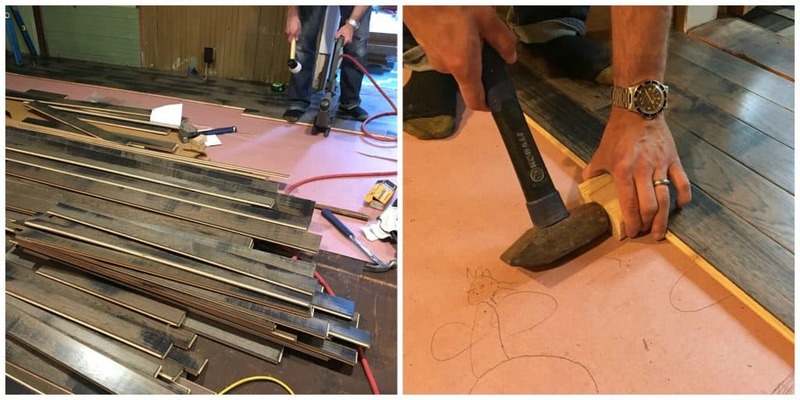 Today we’re going to talk about the flooring, the first step in our kitchen remodel. Our flooring selection was made very carefully with a specific look and character in mind. Our entire house still has the original 1912 fir flooring. 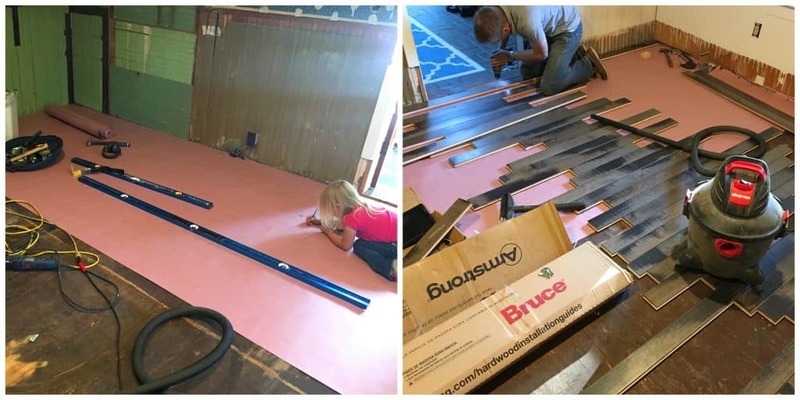 We realized the kitchen flooring would either have to match the other hardwood perfectly (or it would look like we were trying to match it but failed) or it would have to be significantly different to provide a stark contrast. 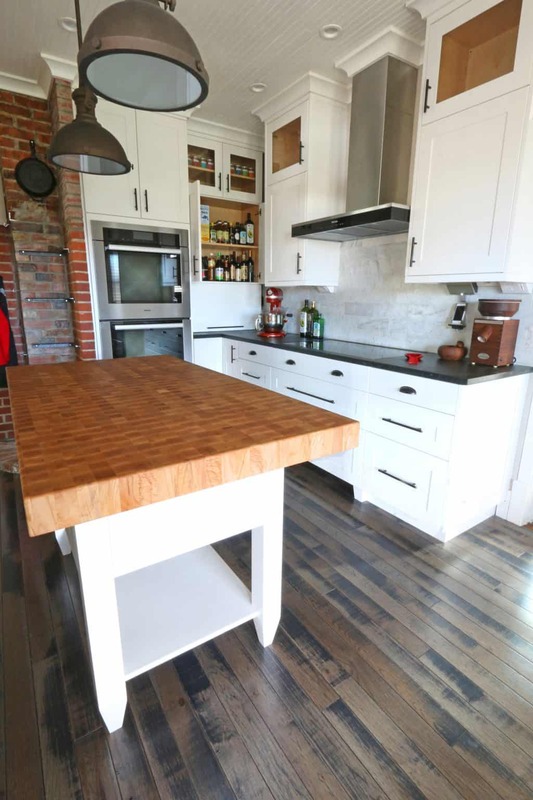 We decided on the latter for two reasons: 1) It would have been near impossible to find and stain reclaimed fir flooring exactly the same shade as the existing hardwood and 2) We wanted an altogether different, more contemporary look for our kitchen anyway. We’ve been really impressed by Armstrong Flooring, both their fantastic selection, customer service, and their commitment to quality since 1860. 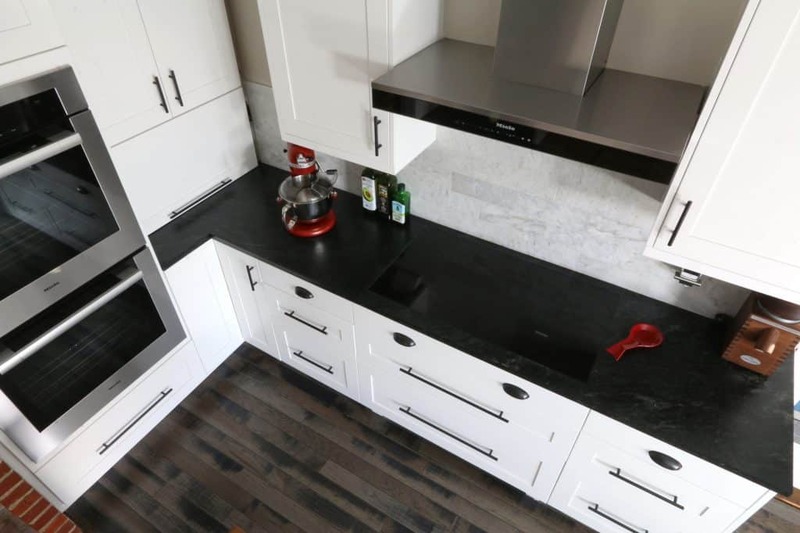 We had already had a very positive experience with Armstrong during our guesthouse remodel so we knew we wanted to use their products again for our main kitchen. For our guesthouse we used their beautiful hickory engineered hardwood and one of their Alterna line luxury vinyl tiles for the bathroom. You can read about that guesthouse remodel here. Installing the hardwood in our guesthouse was our very first experience doing anything of the kind. We were a little nervous but soon found it was much easier than we had anticipated. It took us just one day to install the hardwood in the guesthouse, it turned out perfectly, and saved us a lot of money by doing it ourselves. The guesthouse experience gave us confidence to tackle the flooring in our kitchen. 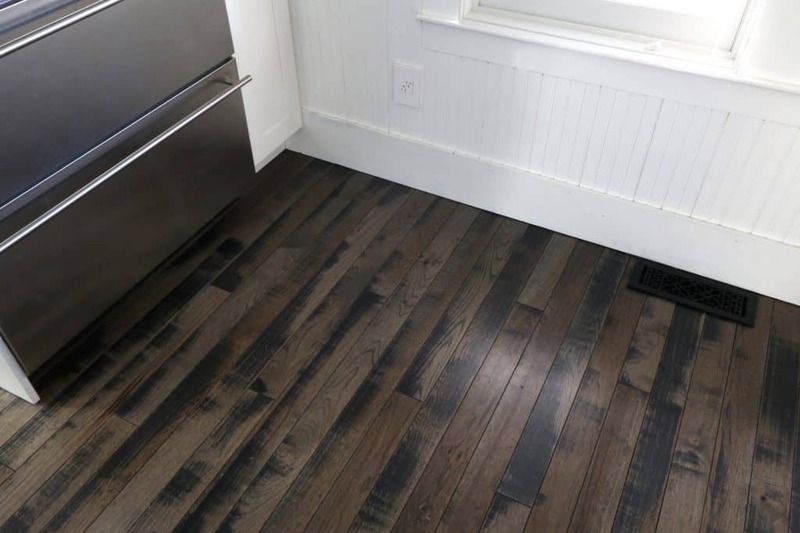 We knew right off the bat that we wanted to go with hardwood flooring for our kitchen. Some people are nervous about the idea of hardwood in their kitchens but the fact is, hardwood is very traditional and wears well. And unless you’re taking showers in your kitchen or periodically dumping buckets of water over your floor and letting it sit there for days at a time, the concern about water damage really is unfounded. For us hardwood was the obvious choice. It’s timeless, true to the historic time period of our home, is merciful on dropped dishes, won’t result in chipped flooring (i.e., tile) every time something is dropped on it, and in our opinion there simply is no material more beautiful than real hardwood. 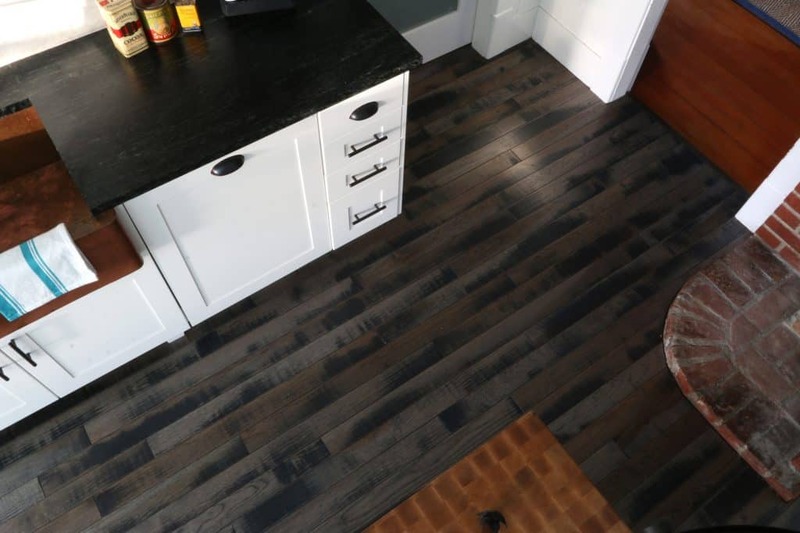 For our traditional-modern farmhouse kitchen we had envisioned a hardwood that is simultaneously rustic and contemporary – something that has that old farmhouse appearance but with a gray-scale color that would provide that balance of traditional and contemporary. We spent all of 2 minutes on Armstrong’s website and found exactly what we were looking for. 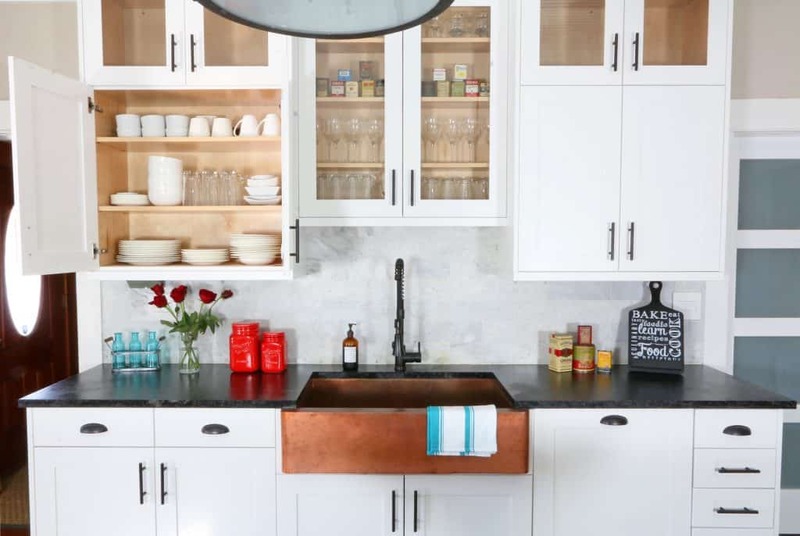 We sent the link to our kitchen designer who not only readily approved of it but said that was the look he had also envisioned for our kitchen. Our selection was Armstrong Flooring’s “Inspired Gray” Hickory Solid Hardwood. It has a beautiful combination of gray, black and brown colors with no two boards alike. The gray and brown combination was also the perfect complement to our gray- and brown-flecked carrara marble backsplash tiles. It comes with a 50-year warranty. With our “Inspired Gray” Hickory Solid Hardwood in hand, we were ready to tackle our kitchen. We laid down some rosin paper as both a vapor barrier and to provide a smoother work surface. The process was identical to that of laying down the flooring in our guesthouse. Our daughter also got to work scrawling pictures of our chickens on the rosin paper. Her drawings will serve as a time capsule of sorts should anyone a hundred years from now tear up the flooring. 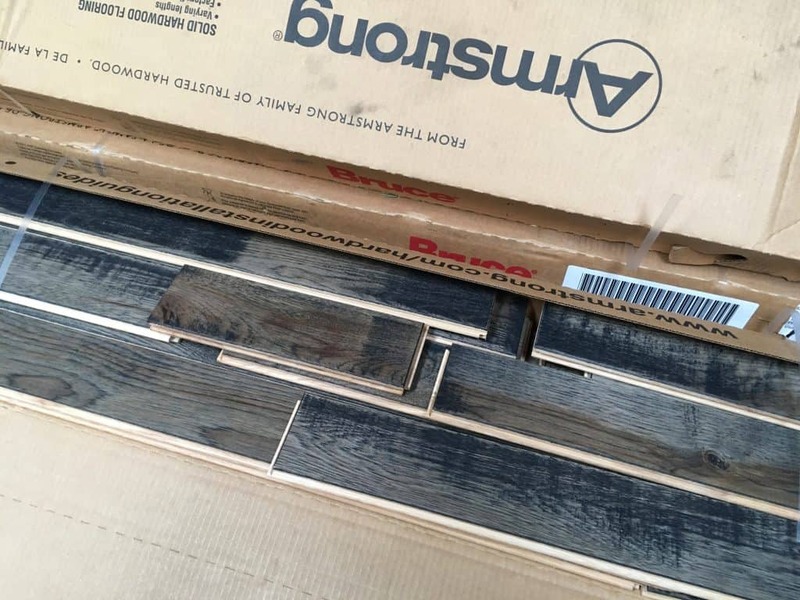 Unlike our guesthouse where we used engineered hardwood that was given a rating of “medium” in terms of installation difficulty, this solid hardwood (and narrower planks) we used in our kitchen had an “advanced” level rating. Once we started installing it we determined there really was no difference in difficulty. Both were very straightforward. 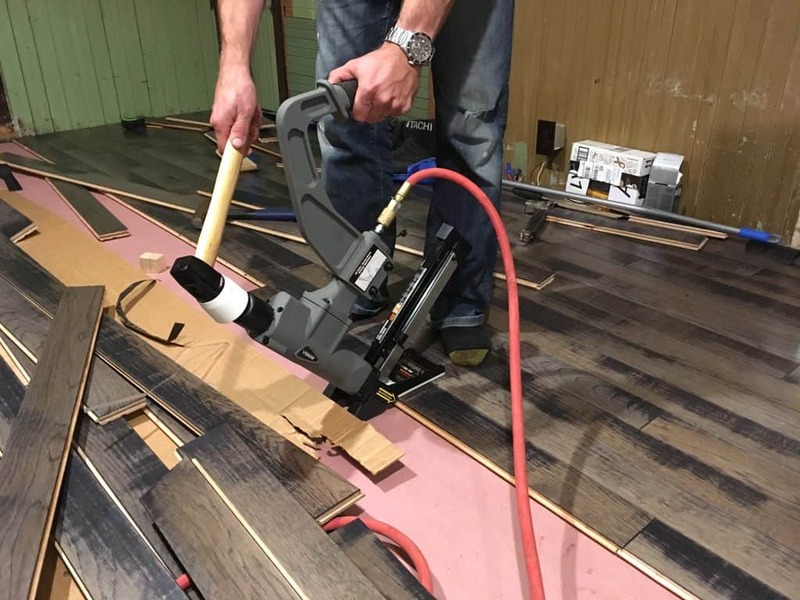 As with our guesthouse remodel, we couldn’t have imagined installing the flooring without a floor nailer. We bought a NuMax 3-in-1 Flooring Stapler/Nailer which we used for both remodels and that was an investment worth every single penny! In two days, Todd and I had the flooring completed and were able to proceed from there with the rest of the kitchen remodel. Layer by layer, as all the other elements of the kitchen were added, everything started coming together beautifully. 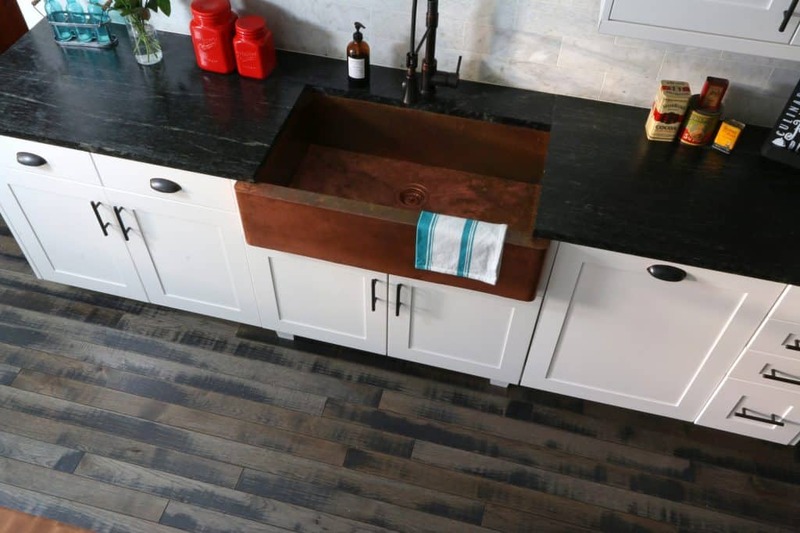 In the picture below you can see the blend of all the traditional materials: Soapstone counters, copper sink, brick hearth, butcher block island, and hardwood flooring. Armstrong’s “Inspired Gray” Hickory Solid Hardwood is absolutely stunning and provides the perfect rustic character while also complementing the modern elements of the kitchen. It’s exactly what we had envisioned. We have gotten so many compliments about the flooring from our friends and family and we couldn’t be happier with it. For more information about Armstrong and to browse their selection, visit Armstrong Flooring. GORGEOUS hardwood! 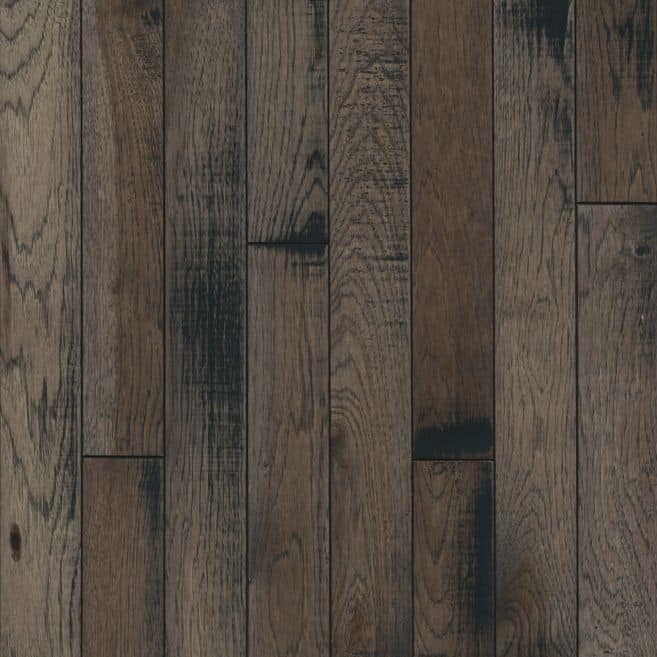 Definitely not your typical run of the mill flooring, it has so much character and I agree, it’s stunning! OH MY GOSH!!!! This is GORGEOUS!!!!! 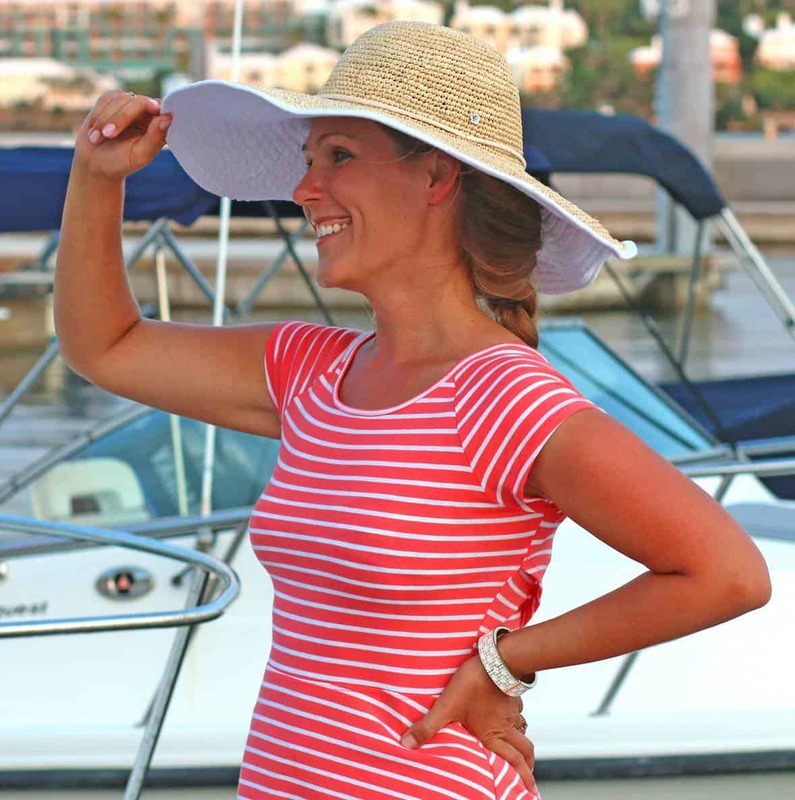 I read every single word of your post, loved it! We just remodeled our kitchen and I REALLY want to do the floors so bad now!!! Going to checkout Armstrong now!! I have totally fallen into a rabbit hole and I blame you! That Armstrong hardwood has got to be the most stunning hardwood I’ve seen! LOVE your choice and your kitchen is GORGEOUS! That flooring is gorgeous, and I love the colors in your kitchen! Your kitchen is stunning! Totally a dream kitchen. I love it so much. I am so glad y’all went with the hardwood floors. They look great in there. We have hardwood in our kitchen too and love it. I am in love with that flooring. What a super fun remodel! I love it! Oh my gosh, that looks amazing. I love the flooring. The whole room is gorgeous. You have done a great job! Looks amazing! That flooring is drop-dead GORGEOUS!!! Your kitchen is stunning!! I love that sink and the wood couldn’t be more beautiful. My mother in law has wood flooring in her kitchen and it looks fabulous. I would consider doing it in our next house when we downsize. Todd, you are a handy guy. You are a regular chip off the old block of your dad. Years ago, in fact the summer of 1981, your father helped me build my house. At first he was a “hod carrier”, the guy who helps the concrete block mason. Your dad mixed cement and brought me blocks and cement to lay the top four feet of the master bedroom wall. It hasn’t leaked or fallen in yet. Then a month or so later he helped me install skip lath on the roof in preparation to lay down heavy shakes. It was 110° in the shade and there was no shade on that roof. I had to finally replace that roof this past summer after the destructive 100 year heavy snowfall of 2016/2017. Still can’t get over how gorgeous this reno is! I am loving this flooring! I love how it turned out! Really gorgeous!